A preview version of Windows Server 2012 R2 is now out, complete with a nag feature aimed at administrators. The new preview pushes related Microsoft services at SMBs via a dashboard that will "remind" administrators to use them. Customers who subscribe to Microsoft's sunsetting TechNet service can now download it. Since it's a preview version, administrators should probably not test it on production hardware. Microsoft also said that features could be tweaked before the final release, but did not announce a shipping date. Users cannot upgrade from an existing installation of Windows Server 2012 to the R2 release; they must, instead, perform a migration, executives said. One of the keys of the new release is to add to the server dashboard with a list of tools that Server 2012 R2 supports, even if the user isn't using them. "In many cases, SMB customers are not even aware of the cloud services that are offered by Microsoft that can help them simplify their businesses," Microsoft said in a blog post. "In Windows Server 2012 R2 Essentials, we have added a services integration status page that shows you not only what services are available, but also whether your server is attached to these services." 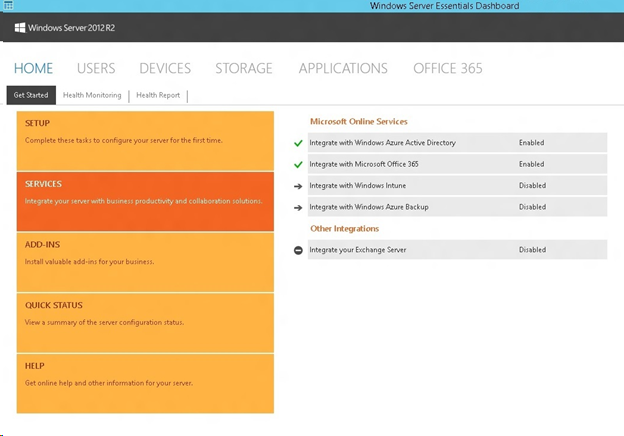 The new dashboard view within Windows Server 2012 R2. Those new services include Office 365, which was first implemented in Windows Server 2012. But the new R2 version also includes support for email distribution groups, mobile device management (including remote wipe, policy enforcement, and access management), and SharePoint library management. It wasn't immediately clear whether the remote-wipe capabilities announced were the "older" version of remote wipe, which erases all data on the device, or an updated capability announced at Microsoft's Build 2013 conference, which deletes just data the company designates as its own. Other services included in the dashboard are Windows Azure Active Directory (referred to as "Microsoft Online Services" in the release) with support for single sign-on; Windows Azure Backup; and Intune, another Windows Server 2012 addition that has been beefed up to allow management of manage users, security groups, and licenses within the dashboard. Although the Essentials version is often run on-premise, Microsoft also said that it would improve its cloud capabilities, turning off client backup and storage spaces by default to smooth installation. Windows Server 2012 R2 Essentials is also designed to work with the recently announced Windows Azure Pack, Microsoft said. In addition, Microsoft said it had attempted to simplify its virtulaization capabilities by enabling the virtualization of a Windows Server Essentials guest virtual machine (VM) on a Windows Server Essentials host server, and allowing configuration of it via a simple wizard. Microsoft also said it will continue to tweak its My Server Apps capability, adding support for SharePoint Online, and has shifted its Remote Web Access capability from Silverlight to HTML5, updating it for touch as well. Perhaps surprisingly, customers who purchased the Standard or Datacenter edition of Windows Server have also wondered why they coudn't take advantage of the new Essentials capabilities. So Microsoft created a "Windows Server Essentials Experience" server role, which enables all the features and dependent services and roles of the Windows Server 2012 R2 Essentials edition without any locks or restrictions. Microsoft didn't say anything about beefing up the capabilities of Windows Home Server, a product that was rolled into the Server Essentials product after years of tepid customer adoption.